Mr Miliband said although all countries were affected by climate change, the poorest people within the poorest countries would suffer the most. He called on the richest countries to take the greatest action to combat climate change. With the world more prosperous, more peaceful and more democratic "than ever before", he called for a commitment to "a more equal world". "We must address the insecurity and inequality that exists beyond our borders if we are to enhance security and prosperity within our borders." He outlined four issues that needed action to fight inequality - trade, conflict, the UN's Millennium Development Goals and climate change. "The need for governments and international institutions to reduce inequalities and promote our common humanity is stark," he said. "National action is not enough. Because the causes of inequality cross national boundaries, we need co-operation between nations, bilateral and multilateral, led by the UN." In a wide-ranging speech on the state of the world, the foreign secretary said of the crackdown in Burma this week: "I call on the regime to allow peaceful protest, encourage national dialogue and promote genuine reconciliation. "Let us today send a message to the monks on the streets of Burma - we support your demand for a democratic Burma." He was speaking after the UN Security Council held talks on Burma and urged restraint by the junta. 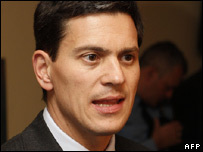 Mr Miliband said it was good that Burma had allowed the UN special envoy Ibrahim Gambari to enter the country.